Women's fashion designer Vera Bradley is attempting a comeback, but it may be going about it all wrong. A classic American company may be showing the right way to do it. 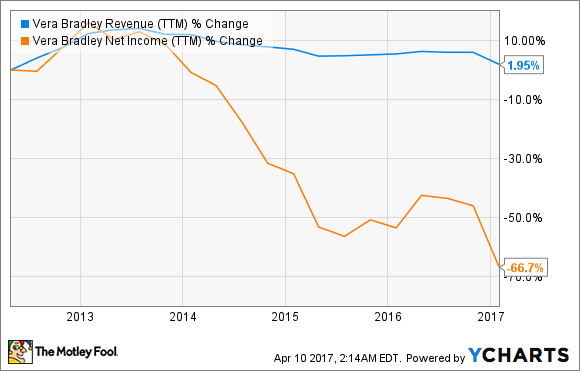 Vera Bradley (NASDAQ:VRA) is having another terrible year. The stock price keeps sinking, along with sales and profits. The last earnings report didn't help matters much, as the company's efforts to update the business are not producing meaningful results. Investors looking for a value might want to look elsewhere. Vera Bradley has been suffering in a tough retail market. Falling foot traffic in stores and intense price competition from other fashion designers have hastened the fall in the top and bottom lines. The last six months were further complicated when a credit card system breach was reported in the fall. To fight back, the company is trying to drive traffic to its reworked website (verabradley.com) and physical stores through three initiatives: a new digital marketing campaign, expanding the brand's visibility with new licensing deals, and strengthening current distribution by closing or relocating underperforming stores. Management admits remaking its business model has been difficult and is taking much longer than expected. In 2016, sales fell 3.3% and profits were down 28.3%, prolonging a trend that has been in place for the past few years. Declines are expected to continue in the year ahead as well, with sales down as much as 5% and worsening profit margins. The company attributes the continued fall to more discounting activity and higher expenses due to new store openings. Vera Bradley is upping its game in the price war, but it's not working. In the world of retail, lower prices and broader exposure of product have been the name of the game in winning market share. Shopper frugality and the need for convenience has helped spur on discounting and the growth of the internet store. With this as a backdrop, what Vera Bradley is doing should start to pay off. But this isn't normal retail; this is the world of fashion. While discounting can help drive sales higher by increasing shopper traffic, it squeezes profit margins. Top-line sales need to grow enough to offset that squeeze, something that has not happened for the beleaguered designer. Lowering prices also has another negative side effect: It cheapens the value of the brand and conditions shoppers to return because of cheap merchandise rather than because of brand loyalty. For a company that competes in an industry that sells non-essential luxe items and fashion statements, building a business on anything other than love of the brand is a dangerous proposition. 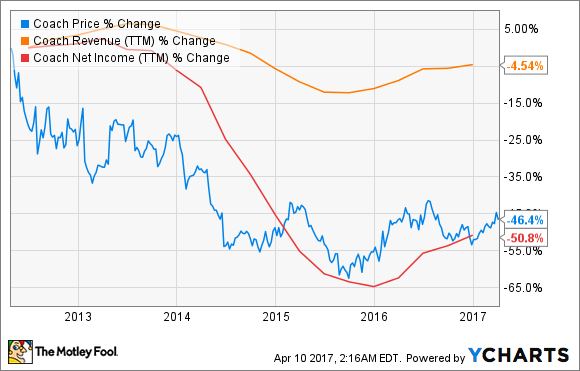 The danger of the discount trap was picked up on by rival fashion company Coach (NYSE:TPR). The leather goods maker is also engineering a rebound like Vera Bradley by revamping its digital selling capabilities, refreshing its product, and remodeling stores. However, where Vera Bradley is lowering prices, Coach has opted to greatly reduce its promotional activity and has also pulled the plug on heavy-discounting distributors like department stores to protect its image of high quality. While the iconic American company still has a long ways to go to return to peak sales and profits from a few years ago, the difference in strategy is beginning to yield positive momentum. While Vera Bradley keeps heading lower, Coach is on the upswing. 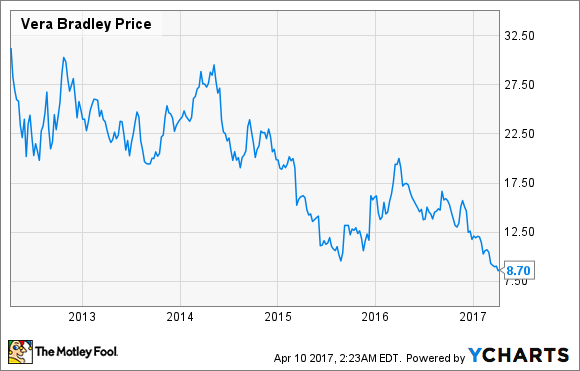 For those hoping to scoop up shares on the cheap, the last several years of declines at Vera Bradley may look intriguing. However, the strategy of increasing sales through discounts could lead to a self-perpetuating problem that continues to eat away at the bottom line. Investors beware: This one could be a falling knife.